Step back into the glamour & romance of the riverboat era! 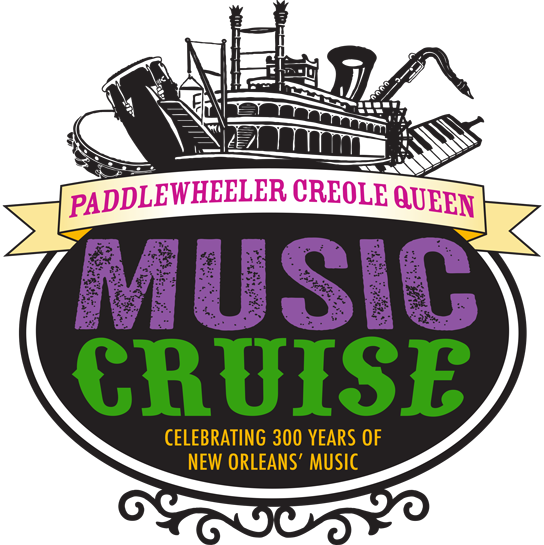 Experience the sounds of Paddlewheeler Creole Queen’s New Orleans Jazz Band while you enjoy your favorite cocktail and maybe a little dancing. Soak in the sweet Mississippi River breezes on our promenade deck as the city skyline slips by under a canopy of stars. If you’re looking for a memorable dining experience, choose the lavish Creole Buffet in our elegantly appointed dining room. This Jazz cruise is pure New Orleans! When night falls, the Paddlewheeler Creole Queen rises to the occasion. Step on board and cruise with us into the night where the sleepless activity of America's busiest port buzzes. The Creole Queen features outer decks with authentically patterned wrought iron trims inviting guests to stroll back in time as they settle into the mood of a bygone era. The interiors are richly appointed with plush Victorian style draperies, soft period lighting, wooden parquet dance floors, and Louisiana Cypress bars accented with brass railing for a warm and welcoming setting. After dinner, enjoy your favorite cocktails and sweet Mississippi River breezes on the promenade deck as the city skyline slips by under a canopy of stars. This Jazz Cruise is pure New Orleans, pure pleasure! Have questions? Ask the Captain! When the weekend rolls around the Big Easy becomes a big party! 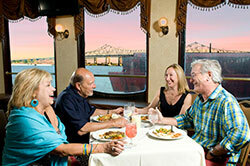 Join us for one of the best tours in New Orleans, aboard the Paddlewheeler Creole Queen. Enjoy all the fun of the nightly Dinner Jazz Cruise, with a new local artists featured every Saturday. Keep in touch on our Facebook page for weekly performance updates. Print out your receipt/confirmation email as your ticket for the tour. Call for discounted group rates. PET POLICY: We do not allow pets onboard. However, certified Service Animals as defined by the ADA are always welcome. Although it is not required, as a courtesy we recommend notifying us at least 24-hours in advance that you will be bringing a Service Animal aboard. Cruise times may be altered or canceled due to weather and safety concerns. Cruise may remain dockside in the event of unfavorable sailing conditions. All reservations must be prepaid by credit card, are nontransferable, and are subject to availability. Any cancellation requires 24 hours notice for full refund. If you book less than 24 hours in advance, please call 504.529.4567 or 1.800.445.4109 for availability.